We tend to think of CBT as a short-term, symptom-focused treatment-so how can we apply it to clients with deep-seated personality disorders? 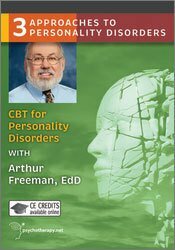 Prepare to have your clinical horizons broadened in this video with Art Freeman, who demonstrates classic CBT with a refreshing, world-wise simplicity while integrating skills and techniques from other approaches. Here, Freeman illustrates how attention to client schemas, cognitions, and the therapeutic alliance can be integrated into a full course of treatment for Axis II conditions, and offers a real contrast to traditional views of CBT. Alfred, ambivalent about therapy and emotionally disturbed, comes to Freeman after the latest in a string of unexpected relationship breakups struggling with feelings of anger, blame and suicidality. At first believing Alfred to be overly dependent, Freeman uncovers narcissistic beliefs, substance abuse, and physical violence that point to a more troubling personality disorder. Honing in on Alfred’s maladaptive schemas-or core beliefs regarding relationships-he asks direct questions that challenge Alfred’s perceptions, while maintaining an attuned and nonjudgmental stance. Freeman offers informative commentary throughout two full sessions, giving us insight into his thought process and rationale for specific interventions. The use of metaphor plays prominently in his work, and helps Alfred make sense of his experience in a way that eases his fragile self-concept and builds trust. Plain-spoken and practical, Freeman guides the sessions toward concrete goals while highlighting the cognitions that threaten to impede the work for this “scary” client. By the end of the video, Alfred has committed to further therapy and finds hope at the prospect of gaining control over his life. Note: This video is part of a series, Three Approaches to Personality Disorders, in which two other masters—psychoanalyst Otto Kernberg and DBT creator Marsha Linehan—work with the same client. This DVD is licensed for individual viewing only. For teaching, training or institutional use, please call (800) 844-8260 to request a group license. Financial: Arthur Freeman is an author of numerous publications with publishers including Guilford, Routledge, Oxford University Press, John Wiley & Sons and receives royalties. Dr. Freeman receives a speaking honorarium from PESI, Inc. Non-financial: Arthur Freeman no relevant non-financial relationship to disclose. 2.5 Self-Study CE credit is available for an additional fee through the publisher, Psychotherapy.net. Information for obtaining CE is found on the DVD and is approved for Psychologists, Counselors, Marriage & Family Therapists, Social Workers and other mental health professionals. "A masterful example of skilled work with an extremely difficult patient. Dr. Freeman provides wonderful examples of accurate empathy and engagement and the artful use of metaphor to help facilitate reflection. Additionally, attention to the therapeutic alliance and repair and countertransference are realistically depicted, including remaining calm in a crisis and deploying tools to facilitate a decrease in suicidal thinking and instilling hope. This is a must-see for anyone who deals with patients who have personality issues and behavioral dyscontrol."